To which I always respond, "Everything in life is personal." Of course criticism is personal. How could it be otherwise? "Don't take it personally," is especially prominent in the world of writing and editing. Recognizing this line for what it is does not mean that criticism is not important. On the contrary. Accepting criticism with professionalism and using it to improve anything that you have written is absolutely necessary. 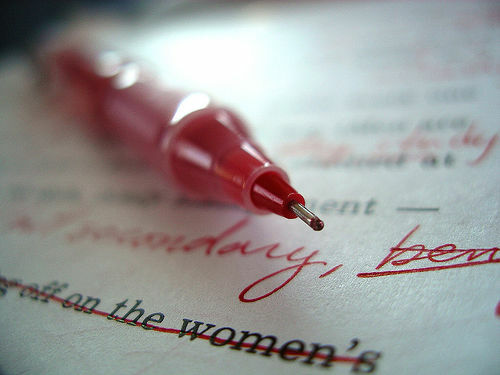 Learning to work together with editors and others who have to criticize your work is one of the most crucial intangible skills that can help you in your writing career. But this strange platitude that everyone and his dog sign onto without ever questioning its logic, should be forever banished as a qualifier in the world of professional writers and editors. Many, if not most, editors are exceptionally skilled and provide the kind of changes and suggestions that help to produce tight, effective writing that has first-reading clarity. A good editor is a true advocate for the reader and only has the goal of working together with the writer to create the best result possible. As the person who wrote the words that are rightly being slashed and restructured, you need those fresh eyes of the editor. The paragraph, document, or book that you have created has become your baby. You may not see skewed syntax or sentences that can lead the reader "down the garden path." However, not all editors are created equal. Some people like to engage in a bit of nastiness under the guise of "telling it like it is," and having "no time for niceties." It would be interesting to learn how often those same individuals also invoke the absurd "don't take it personally" line. This oft-used statement implies that anything you create becomes an entity unto itself and you are only its disconnected, emotionless advocate. But isn't what I am saying really at the heart of the "don't take it personally" line? Isn't it good to distance yourself from what you have written and not let any criticism divert you from the goal of getting the job done? Yes, this notion has some truth to it for sure, but it is so patently obvious that the annoyance factor outstrips its usefulness. And more than that, "don' take it personally" is not helpful because it intends, either consciously or otherwise, to soften the recipient up and encourage him not to engage in any push-back on the criticism. It's insidious because it instantly frames any resistance from the writer as petty, petulant, and childish. The logic behind grammar and consistency changes should be easily demonstrable—though amazingly, not every editor possesses a strong grasp on those concepts—and you won't usually object to such alterations. Style and phrasing are the types of changes that can lead to disputes in the editing process. A simple standard is that the editor must be able to articulate exactly why any particular change should be made. Simply stating that "I just like it better that way," does not cut it and highlights someone as an amateur. So just as overuse of clichés in writing is an indication of lack of imagination and weak writing skills, so too the line "don't take it personally," is often a red flag for a lazy or substandard editor. It would be hard to claim that the utterance of that most cringe-worthy of lines is always a sign of laziness, since it is used so widely. But keep an ear out for it and see how often it comes from someone whose editing abilities are somewhat lacking. And most importantly, don't take the "don't take it personally" line too seriously!